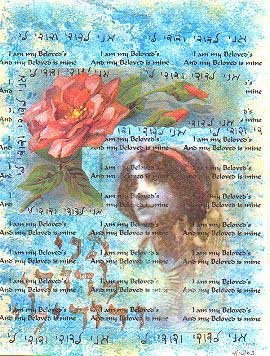 This is a collage piece from one of my art journals that used a ghostly-looking image transfer of a young woman. Some people ask why anyone would want to use a transfer rather than simply collage the actual picture or a copy of it into the work. The usual reason is because the artist is looking for that transparent, irregular quality which simple cut and paste cannot achieve. Look at the image again and notice how you can see right through the woman. This piece was made with an inkjet printout on plain copy paper…nothing fancy, not coated paper or even particularly heavy. This type of transfer will give you the most irregular and ghostly results. In fact, the results are almost always a surprise! This transfer method reverses the image, so if you might want to reverse it in an image editing program if direction is important, especially if there is text involved! 1. 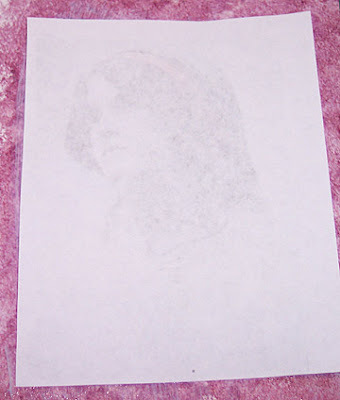 Prepare your receiving paper by painting it and adding any other images that you might want to be underneath your transfer, showing through. 2. 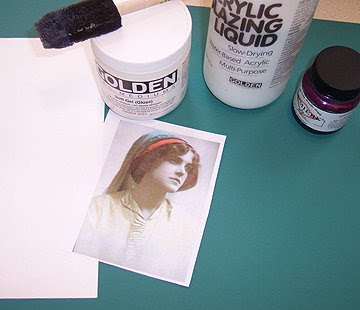 Apply a thin layer of polymer gloss medium to the receiving paper. Quickly position your image, print side down, and burnish it well. 3. Peal up the image paper before it begins to stick too badly. It takes practice to know exactly how long this will take, but don’t worry…irregular is GOOD! 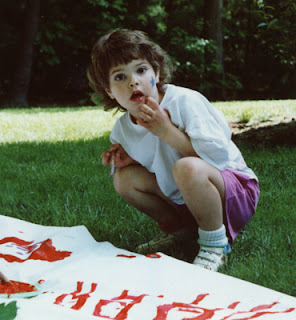 If some of the white paper sticks, it can be easily rubbed off with moistened fingers after the polymer medium dries. 4. Top your piece with matte medium after it dries if you don’t want a shiny surface. That's it! 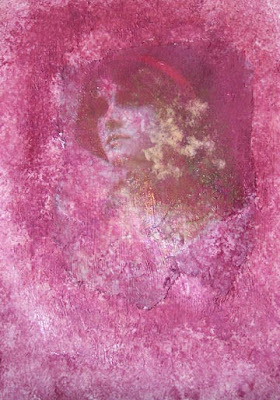 A full list of all my image transfer tutorials can be found here or in the sidebar. Wow - this looks like fun and I already have everything I need to do it =) Thanks! Super easy, Kathleen! But you never know exactly what you're going to get :-) There are some other methods you'll find here that have more consistent results, but this is still one of my favorites. You say to use Polymer medium... Is this the same as regular acrylic gel mediums? Yes, acrylic and polymer mediums are the same thing, but the ones labeled "gel" are a slightly thicker formulation. Liza, this is the *most* irregular of all the methods, leading to the most unpredictable results. If you are having success with the "let it dry and rub off the paper method", that's great...and much easier to control. What works for me with the quick method is to use a very fresh inkjet copy on plain thin printer paper, and to use a thin coat of gel on just one surface. Once it starts to stick, but before it dries, peel up as much of the paper as possible, and then remove the shreds left behind after it dries. It's really very similar to the method you are using, it just gives you a more tattered transfer. Let me know if this helps!